Virtual reality is often an individual experience, with one user shaping and traversing a preprogrammed digital realm. But what if complete strangers could gather together within the virtual realm to construct an architectural edifice? 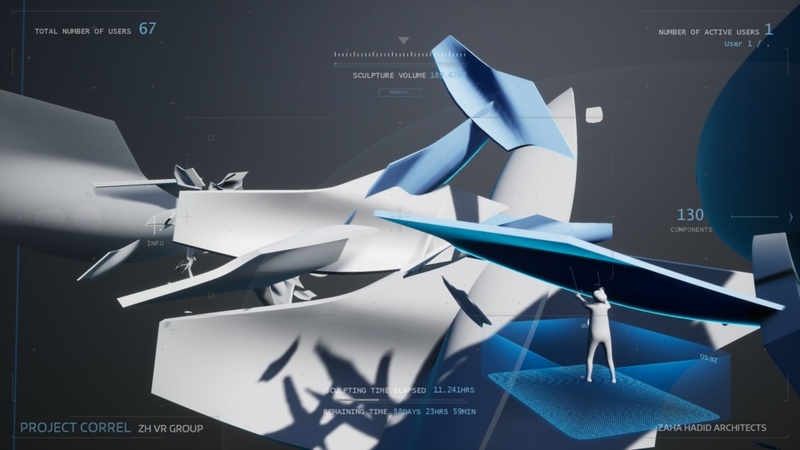 Project Correl is an experiment by the Zaha Hadid Virtual Reality Group (ZHVR) in what it describes as “multi-presence virtual reality,” where users can collaborate on an ever-changing sculptural form. Project Correl is a feature of the larger Design as Second Nature exhibition found in Mexico City’s Museo Universitario Arte Contemporáneo (MUAC), which features photographs, paintings, models, and other mediums highlighting the firm’s in-house technological research. As part of the exhibition, Zaha Hadid Architects’ Computation and Design group collaborated with ETH Zurich to create a 13-foot-tall curved concrete shell formed with a 3-D-knitted framework, dubbed KnitCandela. The VR experiment allows up to four visitors at a time to roam a digital space and manipulate objects found within. The overarching objective for the participants is the collaborative construction of a virtual structure. Over the course of the three-month-long exhibition, successive waves of visitors will immerse themselves in the continually adapting construct, imprinting it with their own personal elements along the way. Collaboration between participants is encouraged by the program’s software; components directly attached to the primary structure within the simulation will remain throughout the course of the experiment. Stand-alone objects must be connected to growing clusters of user-assembled edifices to last throughout the exhibition. Objects that remain solitary will be periodically eliminated from the virtual space. Throughout the running of Project Correl, ZHVR will capture the altering iterations of the experiment and 3-D-print models for display within the exhibition. To create and operate the virtual reality engine, ZHVR worked with Unreal Engine, HP Virtual Reality Solutions, and HTC VIVE. The latter is a novel virtual reality platform allowing for in-depth room-scale, real-time interactions. Project Correl and Design as Second Nature will be on display until March 3, 2019.